Own it on 4K Ultra HD, Blu-ray, DVD & Digital Now. PG - for thematic elements including sorcery, some action, scary images, rude humor and language. In the tradition of Amblin classics where fantastical events occur in the most unexpected places, Jack Black and two-time Academy Award® winner Cate Blanchett star in The House with a Clock in Its Walls. 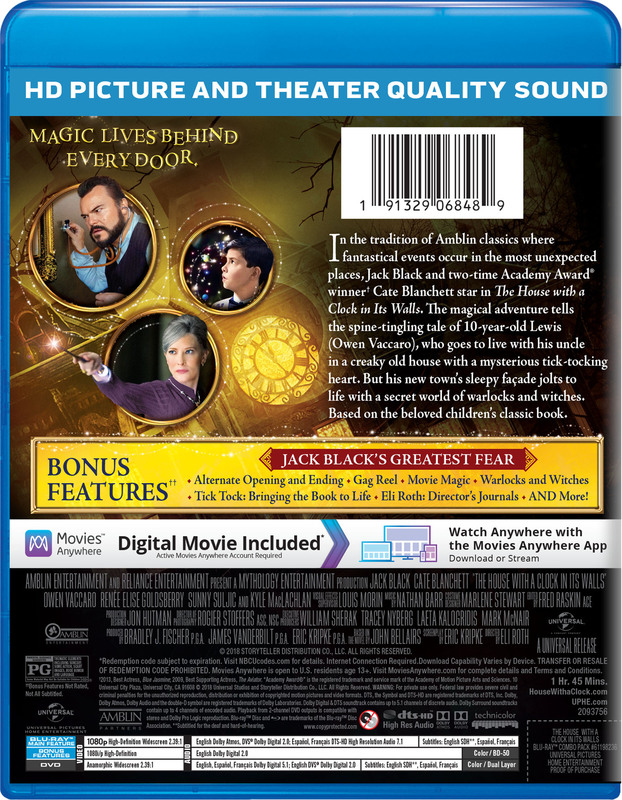 The magical adventure tells the spine-tingling tale of 10-year-old Lewis (Owen Vaccaro), who goes to live with his uncle in a creaky old house with a mysterious tick-tocking heart. But his new town's sleepy façade jolts to life with a secret world of warlocks and witches. Based on the beloved children's classic book. Do You Know Jack Black?